The fact that Edinburgh Capitals’ player-coach Riley Emmerson played half of Saturday’s 8-5 loss to Manchester Storm with a broken arm after a collision with Storm player-coach Omar Pacha typifies the guts and effort of the man. That same spirit was embodied by his team last night as they battled hard but were defeated 2-1 by Elite League leaders Cardiff Devils. Emmerson, who coached from the bench with his right arm in a sling after a morning emergency appointment in a Manchester hospital, said: “We let Saturday get away from us, we were up 4-1 and let that one slip and that left a sour taste in the mouth. In what was Edinburgh’s last-ever game in the Cardiff Ice Arena before the ambitious Welsh outfit move to their new rink later this month, the home side dominated forcing Chubak to make more than a save a minute, out-shooting Edinburgh 64-11 on the night. Caps may have been outclassed by the depth of the Devils, but it was a gutsy and committed performance from an exhausted short-benched Caps side that was warmly appreciated by the vocal travelling support. Luke Piggot opened the scoring for the home side with the only goal of the first period. Devile were then stunned when Edinburgh drew level, recent signing Brandon Thompson diverting a lovely Trevor Gerling slap-pass beyond goalie Ben Bowns for his first goal with his new club. The game looked to be heading into the third period tied at one apiece only for Cardiff to re-take the lead with a goal in the 40th minute. Joey Martin stripped Taylor Dickin of the puck on the Capitals blue-line before centring for Andrew Hotham to blast a finish past Chubak who continued to make a series of saves in the third period to ensure what was a one-sided game remained tight on the scoreboard at least. 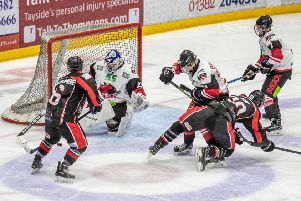 It was a much more even affair on Saturday night when Edinburgh, for whom Paul Zanette and both Gerling and Ned Lukacevic scored twice, surrendered a 4-1 lead at the game’s half-way point to lose 8-5 at Manchester Storm.